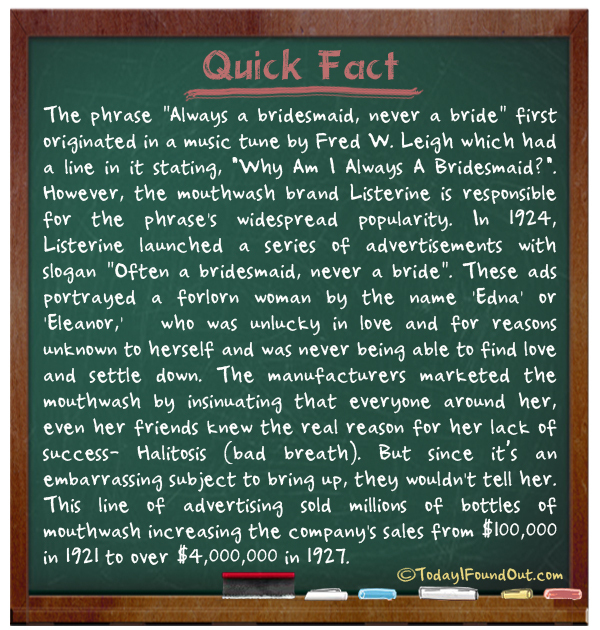 Listerine Popularized the Phrase "Always a Bridesmaid, Never a Bride"
The phrase “Always a bridesmaid, never a bride” first originated in a music tune by Fred W. Leigh which had a line in it stating, “Why Am I Always A Bridesmaid?”. However, the mouthwash brand Listerine is responsible for the phrase’s widespread popularity. In 1924, Listerine launched a series of advertisements with slogan “Often a bridesmaid, never a bride”. These ads portrayed a forlorn woman by the name ‘Edna’ or ‘Eleanor,’ who was unlucky in love and for reasons unknown to herself and was never being able to find love and settle down. The manufacturers marketed the mouthwash by insinuating that everyone around her, even her friends knew the real reason for her lack of success- Halitosis (bad breath). But since it’s an embarrassing subject to bring up, they wouldn’t tell her. This line of advertising sold millions of bottles of mouthwash increasing the company’s sales from $100,000 in 1921 to over $4,000,000 in 1927.